New businesses have an incredibly high failure rate. According to the Small Business Administration (SBA) nearly 50% of all new businesses fail within their first year, with only one-third still operating after 2 years. But why? Most new businesses fail due to lack of planning, underestimating risk and inexperience in the marketplace. As a tax-debt consultant catering to clients across the US, I represent businesses engaged in all types of ventures. Even highly successful businesses can get into tax trouble, the system is just too complicated. But one thing that all of my failing business clients share is their tunnel vision. These entrepreneurs focus only on their core business services and don’t know anything about tax, accounting, business management or client satisfaction. Me: “So how is your business structured, are you an LLC. or Sole-Proprietor? Starting a new business takes guts, intelligence and often significant funding. But even these factors won’t be enough in the long run; there are too many intelligent, ballsy rich guys leading the charge. So, after analyzing and restructuring several companies, I’ve compiled a list of the 5 most crucial tools that every new business needs to succeed. A Harvard Study referenced in several of my research sources (but unfortunately cited nowhere), suggests that companies that plan 12 months have a much higher success rate than those that don’t. Your planning should include choosing the right business structure, an analysis of the competition, projections and tax considerations. Choosing the right business structure can help limit your potential liabilities. As I discussed in greater detail in 5 Steps to Resolving Tax Debt, certain business structures leave you unprotected from assuming business debt at the personal level. Being a Sole Proprietor certainly has benefits but if you have employees it’s probably best to evaluate other entity types. Check out my 5 Common Tax Traps article for more on business tax issues. Analysis of the competition is highly important. Who are the top search results in your industry? How much are they paying for advertising? Is there even space in the market? Asking yourself these questions will invariably open the door to others, eventually forming the basis of a great business plan. Your planning should also include projections, such as a break-even analysis. When output is low, Costs are greater than Income. You should estimate the sales required to surpass the break-even intersection, P.
Tax considerations are often eschewed by head-strong entrepreneurs; they figure they’ll simply hire somebody to handle taxes. Though it’s important to hire the right people for jobs you shouldn’t do, being completely unaware of business tax issues is careless. If you have W-2 employees or sales tax, you must withhold taxes and pay your deposits timely. And the IRS (or state) won’t care that the accountant is to blame for tax mistakes. Business owners are personally liable for certain tax penalties, regardless of how the business is structured. Maybe you offer a service or sell a product that’s not unique. That doesn’t mean you can’t be successful. Most businesses don’t change the world with their products, they’ve simply cut out a piece of the market space. Intelligent businesses that sell products or services in a competitive space typically seek out a point of differentiation, to separate themselves from their competition. For instance, in my industry tax firms initially hired regular sales people to contact prospective tax-debt clients. Eventually one firm began requiring that their sales closers become licensed tax professionals (Enrolled Agents). This point of differentiation allowed the firm to inspire more confidence in new clients and close bigger deals overall. Now the majority of reputable firms have followed suit. This also illustrates the point that you have to quickly adapt to changes in your industry to survive. Do you offer what someone else is offering? If so, are you covering the same territory? If not, is your niche popular enough to generate sales? What will set you apart from the crowd? Will you support a cause with some of the profits? Is your service or product quality better? This goes along with hiring the right people to do jobs you can’t do. A good payroll company will handle employee compensation and file your federal tax deposits on time. This allows you to focus more on your improving other aspects of your business. Also, the cost of payroll services are typically reasonable and may be deducted as a business expense. Make sure you hire a full-service payroll company; some don’t cover the payment of federal tax deposits. If you have an employee handling your payroll, take some time to understand the process so you can oversee it. Though rare, a felonious accountant can do irreparable damage to your finances. If you don’t have employees, you can substitute knowledge on self-employment taxes and how to get the most out of your Schedule C. if you file one. Understanding the numbers is crucial. I can’t tell you how many times I’ve represented business owners who have no idea what they earn and spend each month. Knowing these figures inside and out, as well as typical costs of goods and services in your industry, will allow you to better control your spending. Every quarter, compile a profit and loss statement. 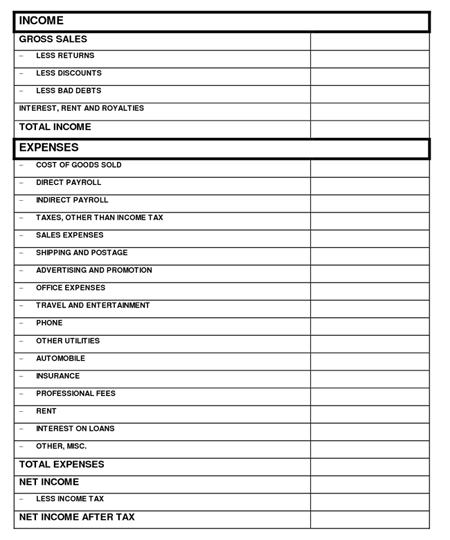 A P&L accounts for every source of income and all expenses or adjustment to reflect your current financial condition. There are a number of other useful reports but a profit and loss is perhaps the most important reflection of your finances. Even if you do everything else on this list, your business won’t survive without happy customers. In our world of instant feedback, bad reviews quickly ruin new companies. Reaching out to unhappy customers will help protect your business from negative press, even though it eats up time. These days many companies would rather offer full refunds than risk negative reviews on a prominent website. Also, if you can instill your brand with some sense of humanity you’ll have a better chance of connecting with your customers, clients or audience on a deeper level. If you sell lifestyle products, including a personalized note with your shipments is effective. Also, making it easy for people to connect with you when they’re unhappy can go a long way towards high customer satisfaction rates. And if you provide services or consulting, contact your clients often to let them know what you’re working on and why it’s valuable. Forming a bond with your clients is one of the best ways to get references and repeat business. What other obstacles face new businesses? Let me know your thoughts in the comments! It’s funny that all of these things seem so basic but are rare to find, especially with many new businesses. I can’t stress having a business plan enough. I’ve worked for several small businesses that floated around without a plan and they suffered as a result. You’re absolutely right! I love the go-getter attitude but business owners should do some intensive planning before embarking on an expensive gamble. Though I’m not the owner of my small company (5 people), I work very intimately with the owner and even as the second-in-command. The fact that the owner regularly audits each employee’s position and work ensures that he is kept in the loop and has time to correct errors. Especially the kind of errors that can occur when an employee (vs. a third-party) conducts payroll and taxes. It is an S-corp company and the owner takes all the liabilities of the company personally. I would say you have to be especially competent and intelligent to run a small company (which is true of the technical field), but I have also seen people run successful companies that you would never talk to on the street.